This is not a paid post. Mamarazzi tarak take $$ for this post. 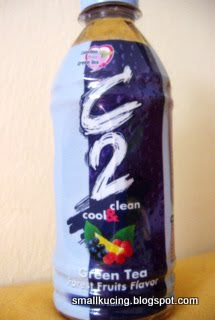 Saja become "white mice" and found that this C2 Green Tea nice, so spread the word to everyone out there loh. Good things must be shared, right? We were given THREE types of C2 Natural Green Tea to try. I heard Mamarazzi said this C2 Cool & Clean Green Tea is not your normal Japanese Green Tea leh. It's made of 100% Natural Green Tea Leaves of Camelia Sinensis variety. 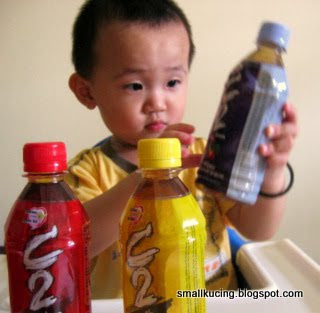 What Mamarazzi liked the most it is that this C2 is not from concentrates nor powder of green tea. Mamarazzi really dislike those "bancuh" from powder type. Must be brew from Tea Leaves baru sedap. In fact, C2 Cool & Clean Green Tea are brewed and packaged on the same day! I don't care what Mamarazzi said. I love the bottle. It's resealable. If I cannot finish it at one short, I can always screw back the cover and drink later. Good for traveling. 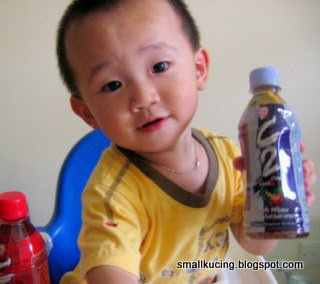 Must remind Mamarazzi to bring a few bottles along when we go gai-gai. Got THREE types here. Can I try them all? After all, Green Tea are said to have the least caffeine and a Powerful Anti-Oxidant against health problems like Cancer, Stroke, Heart Failure and Diabetes. 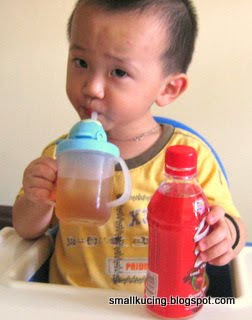 I guess am not to young to start drinking Green Tea gua since it have so many health benefit? I don't like the normal Green Tea which is usually bland or Chinese Tea which is usually bitter. Hmmm...I think these three flavor will suits me well. 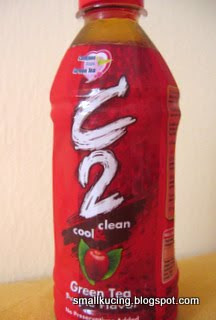 C2 Cool & Clean Green Tea- Apple Flavor. Taste not bad. My personal favourite? Forest Fruits Flavor! Wanna try? Very easy to get buy one. 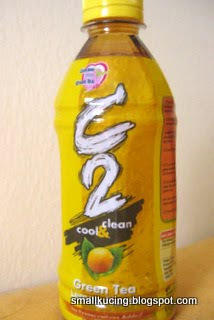 C2 cool & Clean Green Tea are sold nearly everywhere. It's in Mydin, Giant, Jusco, 7-11 and I think I spotted some at the Kedai Runcit near my home. thus should have at your local stores too. Haiz....I can heard Auntie Cleffairy laughing at Mamarazzi's half past six translations of this Chinese saying. Pengsan... I tot Wo Hu Chang Long! 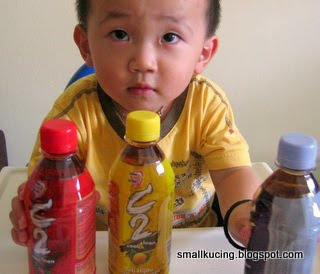 Auntie Cleff, I go to Smallkucing house, drink all first lah......, you want better come earlier...but must bring big big angpao! LOL! Wah, so fast already posted, small small but Speedy Kucing....got mine today, ha ha ha! U also got wor...kakaka..give Auntie Cleff a chance la. She didnt get wor. wah...all trying these green tea.. how come i no have one?? oh yeah, me ipoh hor.. susah and always missing out one.. anyway, wish u all have a great time!! These 3 also have sugar. But I heard C2 have a Sugar Free line of green tea drink too. Very popular in Philipnies. Tomorrow I'll goand see in shopping complex whether it's available here or not? Photogenic but too bad nobody wanna hire loh. Or else Mamarazzi pocket will be bulkier for CNY lor.